It has been a little more year since the first (approximately) 600 Brazilian students arrived in the United States under President Dilma Rousseff’s innovative Science without Borders program. According to our Brazilian friends 5,028 Brazilians have now gone on SWB program. Mission Brazil has integrated education as a top priority, focusing efforts to create opportunities and leverage partnerships in direct support of this game-changing initiative for all of our interests as we build the 21st century partnership with Brazil. This cable reflects at the success our Brazilian friends and we have enjoyed since the official announcement of the Science without Borders program (now officially called Brazil Scientific Mobility Program in English), by President Dilma Rousseff in July 2011. When President Rousseff announced in July 2011 that the GOB intended to fund the study of over 100,000 Brazilian students overseas, many of the diplomatic missions in Brazil, notably the United Kingdom, Portugal, France, Spain, Australia, and Canada, indicated their strong interest in attracting these students to their respective higher education institutions. However, the United States was the only country with a strong (and flexible) education exchange program already in place, and, as a result, received the very first students less than six months after President Rousseff’s announcements and has maintained our inherent advantage ever since. In this, we contradicted some of our own fears and the expectations of other countries, particularly France and Portugal, that the decentralized nature of the U.S. higher education system would suffer in competition with ostensibly more centralized educational systems in Europe and elsewhere. Indeed, some European countries were quicker off the mark with bold offers and audacious plans, but the first organized group of students ultimately put their feet on U.S. soil a full nine months before other countries even got started. It turned out that the decentralized, competitive and seemingly disorganized nature of the U.S. higher education system actually represented a diversity and flexibility that much more easily accommodated the rapid placement of Brazilian students. Mission Brazil’s goal in working with Brazilian partners was to make choosing the United States the most logical choice and getting qualified Brazilian students placements in U.S. institutions as easy as possible. To that end, we immediately engaged with two Brazilian federal agencies linked to the Ministry of Education and the Ministry of Science, Technology and Innovation, CAPES and CNPq, respectively, both charged with implementing Science without Borders, to identify areas of common interest where we could cooperate and problems that could be anticipated and solved. The Mission had long standing relationships with both CAPES and CNPq and had worked on exchange programs before, but nobody had ever done anything on the scale proposed. The initial (2011/2012) problem consisted mainly of identifying a diverse range of potential U.S. institutions that had the requisite strength in Science, Technology, Engineering and Math (STEM) fields as well as the flexibility to take large numbers of Brazilian students on short notice. Helping our Brazilian partners with this required a paradigm shift on their part, as their experience and understanding of U.S. universities or colleges had been limited to just a small number of these institutions in just a few states. Indeed, in the original Science without Borders formulation, Brazilian authorities had wanted their students to go to only the “best” American universities, with “best” defined by Brazilian authorities primarily in terms of a relatively small number of universities with widespread international name recognition. Mission officers worked hard to show our Brazilian partners the depth and diversity of the U.S. higher education system and network, explaining that excellent programs could be found in many places in the United States and that some of the most outstanding science and math programs were found in institutions not as well known outside the United States. For example, Mission officers had great success in raising the awareness among GOB officials of the U.S. network of large land-grant universities and Historically Black Colleges and Universities, because of their long commitment to pragmatic research specifically in the practical sciences Brazil was seeking. To help us explain, we took advantage of visits by U.S. universities as well as alumni networks, but perhaps the biggest single initiative was a program organized by PAS, in cooperation with CAPES, CNPq and dozens of Brazilian universities, to take twenty-eight Brazilian education leaders to the United States in February 2012. We divided these Brazilian education leaders into three groups, visited scores of U.S. universities, big and small, public and private. All the Brazilian academics then gathered in Washington to discuss their findings with each other and with U.S. officials. The entire group returned to Brazil with new perspectives regarding the U.S. higher education system and full of enthusiasm. It is not just a coincidence that the Brazilian institutions represented on the visit contributed many more of their students to the second round of students going to the United States. Post repeated this successful program in November 2012, with an emphasis on graduate studies, taking twenty-eight deans of STEM departments from key Brazilian universities, keeping a similarly ambitious agenda and pace. This second round, there was no longer the need to explain the program’s rationale or convince either side of the value. In less than a year, both U.S. and Brazilian higher education leaders have realized the mutually beneficial and symbiotic advantages for building more institutional links. After these Mission efforts, it was relatively simple to explain and greatly expand the pool of potential colleges and universities acceptable to Brazilian authorities beyond the “elite schools.” Without this change in mind-set, sending such large numbers of Brazilian students in a sustainable fashion to the U.S. on Science without Borders program would have been impossible. There simply were not enough places available at the elite schools, and basing the program primarily on these would not have taken advantage of the great diversity and power of the American nation. With the whole American nation opened up to them, full of possibilities and options. Evidence of the American nation now opened up and full of possibilities and options has been the non-stop, revolving door of visits by American universities to Brazil, including the unprecedented August/September 2012 delegation of 66 American universities, led by Under Secretary of Commerce Sanchez, coming to Brazil for the annual EducationUSA fair. The next serious obstacle we had identified early-on and were committed to resolving was logistical and organizational. Neither CAPES nor CNPq had sufficient staff experienced in placing large numbers of students overseas nor staff enough for managing the process and paperwork in the U.S. They could not easily outsource to a U.S.-based organization because of particulars of Brazilian government rules about making advance payments to foreign-based entities. This is where Fulbright Commission played the pivotal role. Fulbright’s unique binational character plus its long experience in managing similar albeit smaller numbers of exchanges coupled with its excellent reputation and contacts in Brazil and the U.S. allowed the Commission to play a vital intermediary role. Fulbright, in fact, was probably the most important factor in the U.S. ability to act more quickly than other countries to receive Science without Borders students. Working with IIE and later Laspau, Fulbright gave Brazilian authorities the help they needed to get the job done. The Mission’s network of 24 EducationUSA offices spread at major cities in Brazil also spun up quickly at critical moments to respond to the imminent demand. EducationUSA’s critical role in advertising the program to U.S. universities so they could register with IIE in time to receive the first cohort of the Brazilian students and in conducting an outreach campaign in Brazil to guide SWB applicants in person and through online tutorials on how to fill out the Common Application and how to take the TOEFL, the two ongoing needs. Our PA and Consular teams have joined forces with EducationUSA to help counter the perceptions of visas as an obstacle for all exchanges. The first Brazilian selection process (Fall 2011) yielded around 700 qualified candidates, a respectable number considering the 3-month, tight time line and the fact that the program was off-cycle for U.S. academic programs. IIE placed them in appropriate U.S. schools and completed all the paperwork with remarkable alacrity. In order to address the potential problem of getting visas issued in time, as well as to call public attention to the program and our commitment to supporting Brazilian educational aspirations, the Mission held pre-departure orientation sessions and visa days at the Embassy and the three Consulates. Brasilia’s December 2011 program, dubbed “Burgers without Borders,” featured Mission officers, including Ambassador Thomas Shannon, frying hamburgers on a Weber grill to feed hundreds of students while they got their pre-departure briefings by Mission officers, CAPES, and EducationUSA advisers, and waited for their visa interviews. The visa days were covered by media Brazil-wide and the events are still talked about a year later. In December 2012, the Embassy and three Consulates held similar events to send off the third group of Science without Borders students. With the first hundreds of students successfully placed in American universities our Brazilian partners needed help to find, place and send thousands more. A few new obstacles were revealed. Some were simple but very serious. For example, there were simply not enough TOEFL test seats offered in Brazil and those available were often not in the places where students most needed them. One of the goals of the Brazilian program was to reach out to underserved students in underserved places. The existing testing network did not reflect this, nor was it big enough. The Mission worked with Education Testing Service (ETS) to increase both the numbers of tests offered and the diversity of locations. EducationUSA helped ETS find new testing centers at major Brazilian universities. The problem has since been addressed definitively. Brazilian authorities bought rights to 500,000 TOEFL ITP. This test can be and generally is used as diagnostic test and is acceptable for non-degree programs, such as Science without Borders. Again, Fulbright played an instrumental role to make this happen. This acquisition essentially eliminated a testing bottleneck. But TOEFL was in many ways only a symptom of the bigger problem of low levels of English proficiency among potential SwB students. English competency turned out to be the major constraint on the pool of applicants and the problem became more acute as the recruiting reached farther into the pool of potential applicants. The number that could score high enough to qualify for study in the U.S. was low, especially in underserved communities who were important targets of the program. Brazilian authorities committed to funding three to six-month intensive English courses at U.S. institutions. There was no shortage of American universities and community colleges willing to provide such training and the Mission, especially the Regional English Language Officer (RELO) helped identify a wide variety of them, but even this boost presupposed some intermediate level of English, which was often not available. Building English proficiency is a long-term challenge. Experts say that it takes years to build a competent English speaker. This means that anybody who will be going on a SwB scholarship in the next three years is already studying English and has at least a basic competence. There is no such thing as destiny, but demographic facts like this come close. Adequate command of English makes it much easier and more likely that Brazilians will interact with Americans and improving English competency was a Mission goal before the creation of Science without Borders. The Mission has long had an ongoing commitment to English teaching and learning through the activities of our RELO and our network of Binational Centers (BNCs) and we had already geared up our programs to some extent in anticipation of large international events to take place in Brazil, such as the Olympics and the World Cup, where basic English competency would be helpful to Brazilians. But there is a considerable challenge in exponentially ramping up our successful programs, especially since we could not expect significant increases in resources or increases in personnel to run the programs. The Mission offered resources and expertise to develop courses specifically geared to helping students with nearly sufficient English get over the threshold and our BNC network eagerly accepted the challenge. Together we developed a program called “English Cubed” that offered classes in BNCs throughout Brazil. Using year-end-money from Washington, the Mission funded scholarships for low-income students, which several BNCs matched dollar for dollar. This program was successful in helping dozens of students not only make the grade (i.e. the primary objective to achieve at least a 79 on the TOELF), but for some to go above and beyond the ‘grade’ of 79, by up to 30 additional points to score in the low 100s. English teachers and students remarked that E3 was the best course they had ever used/taken, and Post is considering how it supports those BNCs that want to continue the program, but this notable success was not big enough in the face of the truly massive numbers our Brazilian partners were hoping to get. Beyond that, what is essentially a mass education initiative is well beyond our abilities and exceeds our writ, but our partnership for the 21st century depends on our helping to address this challenge with Brazil. In this context, as with education, Mission Brazil continues to be intensely focused on bringing more English opportunity on this larger scale. Brazilian authorities are addressing the need and the Mission is helping to the extent possible and appropriate. Our Brazilian friends announced “English without Borders” in December 2012. It is designed to be a comprehensive program to give large numbers of Brazilian students English competency needed to participate in Science without Borders and generally in the wider world. It is a very ambitious project, which is expected to assess 54,000 university students in early 2013 using the TOEFL IPT as a diagnostic tool. Brazilian authorities expect English without Borders to benefit seven million Brazilians within the next four years. The program has already started accessing students’ English language skills at 59 pilot universities, and will: fast-track students with good English skills into the mobility program; provide those at near passing levels with intensive English instruction, in classes of no more than fifteen students per instructor, and offer instruction in a combination of in-person and online courses for those who need more preparation. The Ministry of Education, along with a committee formed by representatives from 10 universities from all regions of Brazil, has just developed a call for proposals for universities to apply for funds to put together these specific language courses and pay for instructors (approx. 10 per university), who will be identified from their pool of pre-service English language teachers. This prep-course should cover: English language, Academic life in the U.S., TOEFL preparation (the same three elements in RELO/Post-developed English3 program). The Minister of Education, flanked by the Minister of Science, Technology and Innovation and others made the announcement of English without Borders on December 18, 2012. Representatives of all English speaking countries plus others involved with English teaching and Science without Borders were invited, but only the U.S. Mission got a seat at the main table with the Ministers, recognizing the key role we played in helping develop the program. The Brazilian Secretary of Higher Education, agreed to take a a Senior English Language Fellow within the Ministry to help design and implement English without Borders. While final recruitment for the Fellow is complete, a post-funded, interim specialist will start working on the project February 25 to design data collection tools, identify best practices of English language teaching, and support the development of the course at Brazilian universities. In the meantime, Post is diligently identifying a Senior Fellow who will undertake this job on a longer term. This ensures that the Mission is not only present at the creation of this big program; we are taking part in the creation of something our Brazilian friends expect to reach seven million Brazilians within the next four years. We look forward to continued success working with Brazilian colleagues in the mutually synergistic fields of education, English teaching and youth programs. For example, the Mission and CAPES implemented an intensive English language program at the University of Oregon for 20 public school teachers in 2011. Program success led CAPES’decision to increase its share to cover 40, for a total of 50 participants in 2012. With English without Borders the Brazilian government expanded this initiative again, funding 540 scholarships in January 2013 and another 540 going in July 2013. Our Cultural Affairs and RELO team have been working closely with CAPES, CONSED (the Association of Brazilian state secretaries of education), and Fulbright to expand these opportunities for Brazilian Public School English teachers throughout Brazil. PA has been guiding CAPES in its decision, helping to identify potential programs which can accommodate and meet expectations, and to ensure geographical diversity. The inaugural group traveled to the U.S. in January 2013 for their respective six-week intensive programs at 18 different higher education institutions. There are 1651 applicants for the July 2013 program currently being assessed. We are experiencing a wonderful and unique time in Brazilian-American relations. Our interests in linking American and Brazilian education systems and networks coincide with those of our Brazilian friends. In addition, Brazilian officials have access to resources that allow them to fund some of their aspirations in a way that was not possible in the past. Beyond all that, changes in Brazilian demography and the rapid growth of the middle class is creating a burgeoning demand for all sorts of quality education and for related items such as English teaching. Building on many years of work, we are enjoying spectacular relations with Brazilian authorities in the education field at many levels: federal, state and local. In this auspicious time for public diplomacy in Brazil, the Mission has taken full advantage of the opportunities and expanded on them. We intend to continue down this path, which will influence Brazilian-American relationships for a generation. I wanted to come to Brazil to do a good job, to produce excellence – a simple goal. I thought that I might have a chance of doing that in Brazil, since I had earlier experience here. I was lucky enough to be assigned far in advance and could prepare for more than a year and a half. That is a very rare luxury in the FS. I think I used the time well. I relearned Portuguese and did it better than before, read a lot about the country and even memorized all the state capitals. I am halfway through my time in Brazil. Unfortunately, I feel no closer to the goal than the day I arrived. The challenge with pursuing excellent comes not with the pursuit itself as much with identifying the target. Most of the time you are not sure where you should go and when you find a goal it is a lot like trying to find the end of the rainbow. It recedes as you approach, or vanishes entirely. Switching metaphors, it is like trying to grasp smoke. As I wrote in before, one reason why student business leaders or lawyers think that decisions are easy is because they work with case studies. They can almost always figure them out faster and better than the people actually involved, but that misses the point. The hardest part is not solving the problem but rather formulating the problem in the first place. In other words, once you know what to do, how you do it tends to mostly a technical matter of applying known techniques. This is what makes excellence more often a pursuit than an accomplishment. I certainly do not want to denigrate that actual technique of solving problems. All of the time doing things right is necessary for success and often it is also sufficient by itself. Many problems are well-defined and known. I think of it as the difference between leadership and management, with the latter doing things right and the former doing the right things. Besides knowing where excellence is, the other permutation is knowing if you did it. Success in big things always has lots of participants. You really cannot take credit because so many others are working on it in their own ways. I fall back on my old forestry analogy. Most success comes from planting the right things in the right places with the right preparation. After that, much of the next 30-40 years is baked in. But the trees are growing according to their natures. We can take no ongoing credit for what they are doing and of course it is possible to mess things up. Some management is required, but too much activity can be worse than none at all. I think this is another lesson. It is sometimes important to be involved and sometimes important not to be. I am drifting into the stream of consciousness. Speaking of my pursuit of excellence, I think I am just going to give up on the final goal and just do the right things, as far as I can tell what the right things are, as I find them, work more with a process rather than a plan. If I build the capacity to identify and take advantage of opportunities, I think that will be excellence always present but never achieved. BTW - my title and last line come from " Andrea del Sarto," a poem by Robert Browning about a poet who possessed great technical skill but never found subject matter sufficient to make him great. It is much like I am talking about above with the how versus the what. We are experiencing a wonderful time in Brazilian-American relations. Our priority to link American and Brazilian education networks coincides with those of Brazilians. Brazilian leaders have resources to fund their aspirations in ways previously impossible. Changing Brazilian demography and a burgeoning middle class are creating new demands for quality education and related PD items like English. Building on work of earlier colleagues, we enjoy spectacular relations with Brazilian leaders. In this auspicious time for public diplomacy, Mission Brazil is expanding, with two new consulates set to open within the next two years. We have taken and extended opportunities and will continue on this path that will influence Brazilian-American relationships for generations. Brazilians are confident in their country and its growing importance. This colors their view of the U.S. Some anti-Americanism persists, particularly among older elites, but it is diminishing with generational change and most Brazilians have a positive view of the Americans, seeing the U.S. as Brazil’s most important partner. Millions of Brazilians entered the middle class because of the most sustained economic progress in the country’s history and innovative social programs designed to lessen inequality. This provides insulation from boom-bust cycles that have too often affected Brazil. For the first time, a middle class makes up the majority of the Brazilians and they are demanding better government, better schools and luxuries like international travel. The population is still young, but Brazil is experiencing a rapid demographic transition, with fertility now below replacement level, providing space to improve education and social standards. It also creates urgency, since Brazilian leaders know that they must develop the skills of the Brazilian people during a brief “demographic sweet spot,” when fewer dependent children have yet to be balanced by more dependent senior citizens. Internet is creating new channels of communications and fostering a boom in distance education. Adult literacy is improving, expanding the universe of readers and making Brazil an exception to the rule that print is losing ground. Brazil has become a major venue for international mega-events; it will host the Confederations Cup and the World Youth Day in 2013, FIFA World CUP in 2014 and Summer Olympics in 2016. The number of official visits has increased exponentially in recent years, especially in resurgent Rio de Janeiro. To this generally positive picture must be added the caveat that Brazil stiff faces infrastructure deficiencies, physical, human and institutional. This will be both a challenge and an opportunity and PD programs have addressed these issues, especially through the VV and IVLP programs. The Mission’s top priority is creating sustainable partnerships with Brazil and other things follow from that. The most impressive opening is in education. The Mission is encouraging Brazilians to study in the U.S. and supporting President Obama’s 100,000 strong for Americans studying in Brazil as well as fostering institutional linkages for the long term. This is not limited to educational linkages. The Smithsonian Institution, for example, signed long-term cooperation agreements with Brazilian counterparts that will facilitate a myriad of partnerships. Post is creating similar partnerships in English language and distance learning. Within the partnership theme, the Mission is actively seeking to meet the changing Brazilian demography by engaging Brazilians where they live and in their areas of interest. This involves outreach to new populations and geographic regions. Mission Brazil consists of the Embassy in Brasília and consulates in Rio, São Paulo and Recife, soon to be joined by Porto Alegre and Belo Horizonte. Each has its particular emphasizes, but we are one Mission in priorities and programs. Education, English and youth outreach dominate our programming and we are making significant headway. Our youth outreach programs include a robust Youth Ambassador program (last year nearly 17,000 applicants), a Youth Council with representatives from every Brazilian state and various specific programs, such as girls science camp and English immersion programs, as well as electronic and social media programs targeted to youth audiences. English competence is a big challenge for 21st Century Brazil and has been the major obstacle in the way of getting more Brazilian involvement in the U.S. and with U.S. programs. Post is addressing this through our network of thirty–eight BNCs as well as Access programs that reach hundreds of students and boast a dropout rate of less than 4% over two years, as well as programs targeted to underserved communities, especially in Rio and Salvador. In the last two years post went beyond this and in cooperation with the Ministry of Education (MEC) created partnerships to improve Brazilian English competency on a massive scale. “English w/o Borders” will be rolled out in 2013. The Mission helped inspire this strategy and works with Brazilian partners to guide. We are placing a senior English Language Fellow in the Ministry of Education to help with the implementation. In 2013, 1080 Brazilian secondary English teachers will take six-week courses at U.S. universities in a cooperative Mission/MEC program. MEC will test 54,000 Brazilian students in English and provide support for them to improve sufficiently to take part in programs such as Science Mobility. MEC expects to reach 7 million Brazilian students in the next four years, many through distance learning, another fertile area of Mission cooperation. U.S. Brazil education cooperation was transformed after the Brazilian President’s July 2011 announcement of the Science Mobility Program to send 101,000 Brazilian students overseas in the STEM fields. The U.S. got there first with the most, confounding our fears and perhaps expectations of competing countries that the decentralized nature of U.S. higher education would suffer in competition with ostensibly better organized centralized systems in Europe and elsewhere. The Mission’s goal in working with Brazilian partners was to make U.S. the easiest and most logical choice and quickly get qualified Brazilian students places in a broad array of U.S. schools. Nearly 4000 Brazilians have gone to the U.S. on the Science Mobility Program and tens of thousands more will go in coming years. Post is now pivoting to sustainable institutional linkages by supporting visits by U.S. institutions as well as taking Brazilian education leaders to the U.S. This is all on top of our already active educational advising and Fulbright exchange programs. Reaching underserved populations is a key priority that suffuses all PD programs, specifically through focus on JAPER and support for favela pacification and women’s empowerment. As Brazil is and perceives itself to be a leader in sustainable development and clean energy, post remains active in this field. The Mission cannot expect to get the human resources adequately to reach the “new” Brazil while keeping relationships with the still most important parts of traditional Brazil, but leveraging the great resources of the American nation is expanding our impact by creating sustainable connections. American institutions are eager partners who often need only advice and minimal support to create connections that will last for generations. We also reach previously inaccessible audiences using new media and taking advantage burgeoning broadband in Brazil. PD Brazil’s enviable problem is too many excellent opportunities. We prioritize those that involve full partnerships with Brazilian institutions and government, use our local expertise and flexibility, and provide significant leverage to produce outstanding results. These may not look like traditional programming, i.e. bringing a speaker or placing an article. Building on the great networks constructed by our predecessors, we have been able to concentrate efforts where they are most effective. We think this is the bright future of PD in Brazil. I have been riding my bike a lot more because I pulled a muscle in my right leg. It is a strange sort of injury. It doesn’t hurt at all most of the time, but if I walk more than a few hundred yards I get a feeling of extreme fatigue on the side of my leg followed by a tightening of the calf muscle. It passes in a few minutes if I stop walking but it has stopped my walking. I didn’t realize how much I walked. I was spending about two hours walking in the evenings, listening to my audio books. This was in addition to walking to the store or restaurants. Walking is not working, but biking is okay. I have been using the bike as transport and exercise/recreation. There are two problems with biking. I cannot do it after dark, when I was walking around listening to my audio books, and I cannot listen to my audio books while riding my bike no matter what time. It seems strange to ride five minutes to restaurants in Deck Brazil, but I have been doing that. The bread and grocery stores take about ten minutes. This would still be a preferred walking distance, but not so strange. The exercise/recreation part is more straightforward and I will have to do it until I can walk and run again. Brasília is not a good biking city, at least not for my style of biking. As I have written before, it is kind of a 1960s science fiction vision of what the future would be. People were expected to drive everywhere and be organized by the city. So you CAN ride a bike or walk, but you are meant to drive to the place where biking or walking was designated. Getting between these designated regions w/o a car is nearly impossible. Sidewalks end; roads narrow and ramps are made for cars not people. There is an impressive amount of open space, but not usable space. On the plus side, the city could be easily improved. On the downside, some people want to protect the legacy of the original plan. I don’t understand why, but they do. I rode my bike to the Botanical Garden a few days ago and to the City Park yesterday. The bike ride to the Gardens was easier. On this side of the lake the planners had a less pernicious effect. You still have to ride along a busy road, but there is a bike lane. The problem is that there is only one entrance to the Garden and that is on the side farthest from my house, which means I have to ride around five miles around. The Garden also sits on top of a ridge. It is not a very steep hill, but you have to go up for about two miles with no going down or even flattening. Coming back down is not as much fun as you might think because you go too fast and have to fear for merging cars. I like the Botanical Gardens. They are mostly wild and not too crowded. But the ride there is a bit to arduous to make regularly. The City Park is nice. It has a long bike/walking trail. This is one of those places designated by the planners as a place to ride or walk. The park is pleasant. I used to run there when I was in Brasília in 1985. It was less developed then and the trees were smaller. Like the Garden, the problem is getting there. There was not much traffic on the roads because of Carnival, so I was okay, but a bike would not be safe much of the way on an average day. It is also mostly uphill on the way there. You climb gradually out of the valley. It is not very hard but consistently hard. As I ride and walk around Brasília, I always think of what could have been and what still might be. This city has a great climate and topography. It is an ideal city place for things like walking, biking, sidewalk cafes etc. They could easily construct a network of bike and walking trails on much of that open land and along some of the streets. A few well-placed stoplights would make it safe to cross the busy streets. They are probably too wide to put up pedestrian bridges. I know all this would deviate from the original plan, but the original plan is outdated. The planners built for conditions and habits that never came to pass and people’s preferences are not what they thought. My bike riding is giving me a strange type of tan. You can see the contrast in the picture above. The top of my hand is brown from the sun, but the fingers stay mostly pink since they face down. Other pictures: On top are pine trees in the City Park. I remember them being much smaller, but it is very pleasant in their shade. Next is Brasilia from the City Park. Below that is a path in the Botanical Garden and then a "blitz". Brazil has a zero tolerance law now for alcohol. At one of these blocks, the cops stop everyone to check blood levels. All good things must come to an end; bad things too. Things seem to stay the same for a long time, then suddenly shift. Punctuated equilibrium. We didn’t notice the inflection point. I mentioned decline of Hispanic immigration and the unexpected reduction in U.S. CO2 emission elsewhere, things that seemed would never end. Now the prison boom is ending. Prisons are closing because there are fewer prisoners. I think we are surprised when trends end "so fast" because we tend not to notice the trend at all until it is completely manifest in a mature stage. In other words, trends are often peaking and nearing decline by the time we see them. There is the old and somewhat cliché story about a pond being covered by lily pads. I will repeat for those who have not heard it. People walk by a pond every day w/o noticing many lily pads. Finally, they notice some and then in a few days it seems that the whole pond is full. This seems like magic, but it is simply the result of normal growth, which under some conditions is essentially exponential. Here is the hypothetical. One lily pad covers 1/100. Two cover 2/100 four cover 4/100; 8 cover 8/100. 16 cover 16/100. This is when you might notice them. The next squaring gives us 64/100 and next the whole thing is covered in what seems no time at all. Trends can collapse just as fast. Extending our lily pad story, by the time we notice that half the pond is covered, they are beginning to shade each other out. The decline is started by the time we see the climax. The Hispanic tsunami ran out of power because of rapidly falling birthrates in Mexico and better job prospects there. We COULD have seen that back in the 1990s. Dropping U.S. emission came from shifts to natural gas and higher prices for oil. We could have seen that back around 2000. The prison population follows the crime rate. Crime rates were growing until the early 1990s; then they fell. With some lag time, fewer criminals mean fewer inmates in prison. We could have seen this coming by around 2005. What is the next trend that will grow and collapse? If I knew things like that, I would be rich. In retrospect they are easy to see; not so easy in prospect. What I can predict with near certainty is that many of the predictions that we are making today will look silly in five years and that many of you who believe them now will claim that you knew the changes were coming. I have been reading an interesting book called "Anti-Fragile". It is by the the same guy who wrote "Black Swan" & "Fooled by Randomness." The main idea is that we cannot really assess risk and certainly cannot predict the future, so the best strategy is to create systems robust enough to absorb the shocks we know will come but cannot predict in sufficient detail to address or avoid. I think that makes sense. Finland & South Korea – that is what works. The problem with copying this success is that Finland and South Korea follow almost polar opposite strategies. South Korea is #2. They follow what seems like a hellish, highly competitive study system where the kids study from early morning until late at night. In contrast, #1 Finland follows a laid back Andy of Mayberry plan. Kids don’t do much homework at night; they don’t even do schoolwork during all of the relatively short school day. Clearly one size does not fit all and culture makes a big difference. East Asia has a hierarchical educational system with roots in highly competitive civil service examinations that go back 2000 years in China. In theory, anybody could take the test. The tests were cruelly hard, pass rates vanishingly low and the stakes dizzyingly high. Passing the test meant prosperity for the aspirant and his whole family. Failure could mean poverty & misery. This testing culture persists. Finish culture is very different. Hierarchy is not much respected and the idea that a single test could determine someone’s future just doesn’t seem to make any sense in the north woods. I am glad that Finland beats out South Korea, even if it is an irony that it in some ways uses a hierarchical list to argue against a hierarchical system. Mine is clearly a value judgment and I don’t shy away from making it. Hard work is an important part of life but it is not the only thing and it is just smart to accomplish our goals with as little effort and suffering as possible. Phrases like “you are always looking for the easy way out” and “you are just picking the low hanging fruit” are often used pejoratively, implying that there is something wrong with doing these things. But who is stupid enough to advocate a harder way to do something if a similarly successful easier way is available? I am willing to work hard when I must but I find no virtue in working hard unnecessarily. I like this phrase, “if it NEED not be done, it need NOT be done.” Lots of what we do during a workday add little or no value to the goals we are trying to achieve. One of our top jobs should be to determine things that need not be done and eliminate them. Presumably we can redirect our efforts to more effective and higher priority tasks. One priority task that often gets short shrift is thinking about what we are doing and/or preparing to do so by reading good books or taking training. If you are worried about the exact language in a memo requesting a package of pencils, you are not doing your job or your job isn’t very important. This is what may be happening with education in these places. Korean kids are working full out and producing excellent results but probably spreading their efforts to include lots of low or no priority activities. It is a kind of full court press. It gets everything done but at a high cost to participants. We emphasize effort a bit too much. Sometimes the added results are not worth the added effort especially if you have other options. What to do is as important as how to do it. Pick the low hanging fruit first and if that is all you need, move along to the next task. There is no virtue in doing what need not be done, unless it if fun and then that is a different type of game. I didn’t really talk much about what works in education. I suggest you listen to this from NPR that inspired me to write. I ordered on Amazon the book “Finnish Lessons” mentioned on the program. Maybe I will have a few more ideas after I read it. I have already decided that I would not want the U.S. to copy the Korean model. Finland looks better. The U.S. used to be the model of economic freedom, but as you can see from the nearby chart, we are losing our edge as others catch up. The “Economist” runs an interesting survey of the Nordic countries. They are not what we recall. Sweden, for example, has school voucher program that would make Milton Freidman proud. Economic freedom in the U.S. peaked around the year 2000, right about the time of our great prosperity and declines after. Meanwhile, the Nordic improved their results and we are now at about the same level. Please read the articles starting at this link. In many ways, the Nordics got to the future first. 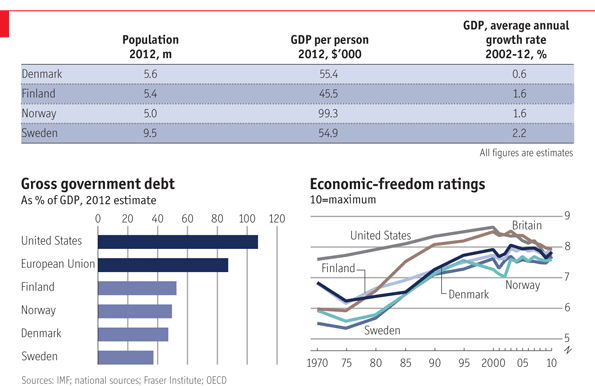 The Nordics have not given up on their welfare model, but they have harnessed the power of the market to help pull it. They have vouchers for schools; private firms running public hospitals and vastly liberalized labor markets. BTW, we are using that word liberal in the original sense, meaning that employers have more freedom to fire workers. But they protect workers with retraining. Countries like Norway, Sweden & Denmark can never provide a complete example for a big and diverse country like the U.S. Denmark, Norway and Finland are comparable in population to Wisconsin or Minnesota and even the most populous of them, Sweden, has very people than North Carolina. One reason they can do so much is that they are not very diverse and so avoid both many of the challenges and benefits of a variety of different people. In fact, they have significant trouble integrating immigrants. But just as the states are laboratories of democracy, small countries can provide ideas that we can see tested. Our Scandinavian friends have tried the routes and driven it to dead ends but have done other things that have achieved success. They have not given up on social justice, but they are learning to use freedom and market mechanisms to achieve success. Anyway, I suggest you read the survey at the links above and ask what we can learn. Our infrastructure is getting old and needs to be renewed. It is not news that much of what we use today was built fifty, a hundred or more years ago. America was a much poorer & less advanced back then. A question that we should ask is how did a country so much poorer than we are today, with less developed technology and significantly smaller government spending do what we cannot? How can we shovel such piles of money out the door and have so little to show for it? The "Economist" has an article about our decaying maritime infrastructure that gives some hints. It talks about a lock that connects the Mississippi River to the Inland Waterway. This is worth billions of dollars in commerce yet it was built in, "1921, and is 600 usable feet long, or half the length of a modern lock. Its replacement was authorised in 1956. Construction on the replacement was authorised in 1998, and then stalled by lawsuits." reference. We used to be a nation of doers, engineers & visionaries and now we are a nation of wimps, weenies & lawyers. We used to design stuff and then just do it. There usually was lots of gnashing of teeth, but things got done. We finished the Hoover Dam in less time than it takes to get an environmental impact statement through the process. I read an interesting book about Hoover Dam called Colossus, on the building of the Hoover Dam. Almost each time I turned the page, I said to myself, "We could never do this today." With the lawyers, NGOs and NIMBY folks arrayed around, they would not have been able to toss the first shovel full of dirt. I don't doubt that we wiped out at least one subspecies of beetle or snail, but who knew then and who cares now? We really need to get better at this. We don't have to learn new lessons; we simply have to relearn what we used to do. Remember, we build most of the stuff we have to renew when we were poorer & less advanced and government budgets were much lower. We did it before and should be able to do it again. On the plus sides, shale gas is creating an industrial renaissance in the Great Lakes region. Gas has been a real game changer and barge and ship traffic is is expected to improve more than any time in the last thirty years. I know this is a little off topic, but I grew up on the shores of Lake Michigan and anything having to do with the Great Lakes fascinates me.